While attending the 2017 Biketoberfest rally in Daytona Beach, Florida, members of the Iron Horsemen Motorcycle Club (IHMC) were the target of blatant profiling and discrimination at the hands of the Daytona Beach PD. The incident, caught on videotape as a result of quick thinking, is irrefutable. 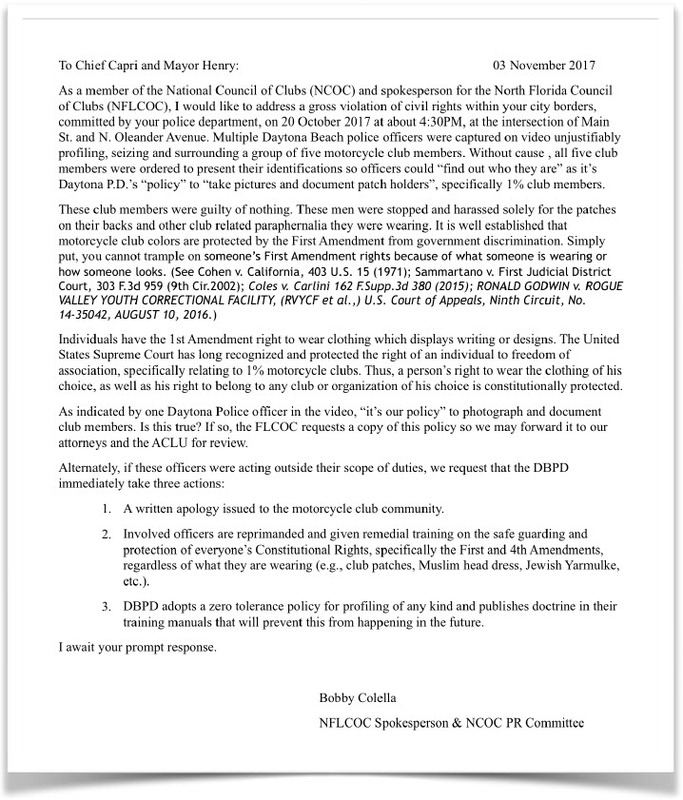 The impact on civil liberties motivated the combined efforts of the North Florida Council of Clubs (NFLCOC), the National Council of Clubs (NCOC), and the Motorcycle Profiling Project (MPP) to immediately respond with a formal complaint and public record requests. These inquiries, based on the video, have sparked an investigation into the actions of the officers involved and a review of Daytona PD policies regarding motorcycle clubs, says a source inside of Chief Craig Capri’s office. Already, as a result of the State Attorney’s inquiry, a curriculum is being constructed and all Daytona PD officers will be re- trained relating to motorcycle profiling. Activism works. On October 20th, 2017, members of the IHMC, while walking down the street doing absolutely nothing wrong, were stopped and surrounded by Daytona PD officers and asked to produce identification. Why? Video captured by the IHMC reveals that the seizure and demand for identification was based solely on individuals wearing colors identifying membership in a 1% motorcycle club. In fact, Daytona PD officers explain on video that stopping and documenting motorcycle club members is standard department policy. A member of the IHMC, exercising his constitutional right to film police in public, captured the entire event on video. Video can be irrefutable proof of wrongdoing in a case of motorcycle profiling. The video also served as the foundation for a successful complaint that is triggering review from within as well as by the state’s attorney. This is not the first time that the Daytona Beach PD has been caught on videotape further establishing a clear pattern of motorcycle profiling. Video from earlier in 2017 captures DPD Chief Capri confirming that if you wear a patch in Daytona Beach you will get pulled over. These videos prove that the issue of motorcycle profiling is systemic in Daytona Beach, even reaching the highest law enforcement office, the Chief of Police. This incident is a textbook example of how an effective grassroots movement can handle an incident of motorcycle profiling that occurs in the motorcycle club community. First, the IHMC, from the beginning, made sure to capture the incident on video. The video is the critical piece of evidence referenced in all further developments. Second, the video was released through grassroots media like the MPP and shared on social media, which resulted in thousands being exposed. Web media and social networking provides an alternative mechanism to communicate an effective message that is not reliant on traditional news media outlets. Third, the Florida and National Council of Clubs utilized the video as the foundation for a complaint to the Daytona PD which has triggered an inquiry that has resulted in re- training an entire department and could result in reprimand and/or reform for officers caught profiling on the video. It’s easy to say that things can’t be fixed or that profiling comes with the territory and has always been a problem for bikers. But fighting back using the democratic process and media that isn’t controlled by monetary motivations can help reduce profiling and secure the freedoms all people should enjoy. The MPP will report any developments or updates. The post Biketoberfest Motorcycle Profiling Video Sparks Investigation & Retraining appeared first on Motorcycle Profiling Project. This entry was posted in Motorcycle Profiling Project on December 20, 2017 by Webmaster.